Alex Clarke at Denison Yacht Sales asks me to mention that he's still in search of that special buyer interested in beginning construction on the 72.5m Columbus Global Explorer, ready to begin construction immediately at the Palumbo facility in Naples, Italy. 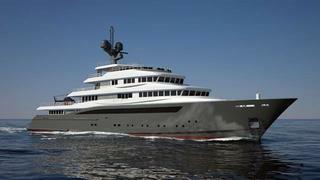 This is a true global explorer aimed at traveling to the far corners of the world's oceans. The hull can be reinforced to ice class allowing the yacht to traverse the world's polar regions yet with the comfort expected in a luxury yacht. Flexible in design, both the interior décor & layout plus the exterior profile lines & deck spaces can be altered to suit the demands of any client. The asking price begins at €50m with a projected 30 month build time.